The diagrams can be run simultaneously. There are no restrictions on either the volume of measurement data or the number of channels. The DataService enables uninterrupted portrayal of online and offline measurement data. Users can zoom in on archived data during a measurement run. This function is unique and especially valued by users. ProfiSignal Go is also capable of processing large data volumes. The Go recording algorithm ensures readability of all information at the highest zoom settings. Peaks remain visible even for extremely long time ranges. This function facilitates the searching of maximum/minimum values. ProfiSignal Go includes the complete DataService software. This software enables convenient data storage and archiving functions. Measurement data can be stored to files or to databases. ProfiSignal Go is for use with Delphin's Message and Expert series. ProfiSignal Go is also equipped with an OPC Server and Client, a Modbus TCP interface and a programming interface. Drivers are also available for all the standard data acquisition systems, e.g. VXI, HBM, NI, PSI and the ADAM modules. The modular design enables inexpensive programming interfaces. In conjunction with the DataService, ProfiSignal Go provides a diverse range of alarm and monitoring functions. In the event of alarms, digital outputs can be switched and users notified via email. An alarm table provides an overview of current and archived alarm events. ProfiSignal Basic is designed to be fully configurable and compatible for continuous processes (e.g. operational data acquisition) as well as batch processes (e.g. data from experiments and trials). Basic includes basic automation functions for measurement procedures. Basic includes every function from ProfiSignal Go. A large range of operation and observation objects enable the simple generation of process visualization diagrams. These are available with analysis functions. Operating and monitoring functions can be organized into viewing images. Even inexperienced users are able to quickly generate their own applications. These are generated in development mode and can then be switched for operation to runtime mode. The integrated DataService, especially suitable for large amounts of data, enables historical data to be immediately displayed on the screen at high-level resolution. Evaluation can take place from the company network or from anywhere in the world. Measurement data can be stored over extremely long periods of time. For vibration analysis or for the evaluation of transient events, data can easily be acquired and stored at kHz-sampling-levels. Recorders allow data acquired for specific tasks to be stored in separate files on the PC. A range of diagrams are available for measurement data analysis. Y(t) diagrams enable high resolution portrayal of continuous processes over long time periods. This is particularly beneficial for quality assurance and fault diagnostic systems. Both slow and fast signals can be combined in one graph. A formula manager enables online and offline computations of measurement data as well as the recording and portrayal of computed results. Complex efficiency computations as well as basic temperature averages are simple to perform. As well as measurement data and computed data, a report may also contain objects such as y(t) diagram (trends), y(x) diagram (characteristic curves), tables, illustrations, input data and text. Reports can be generated and archived automatically according to time or events. This is an ideal tool for quality assurance, quality certification and accounting purposes. 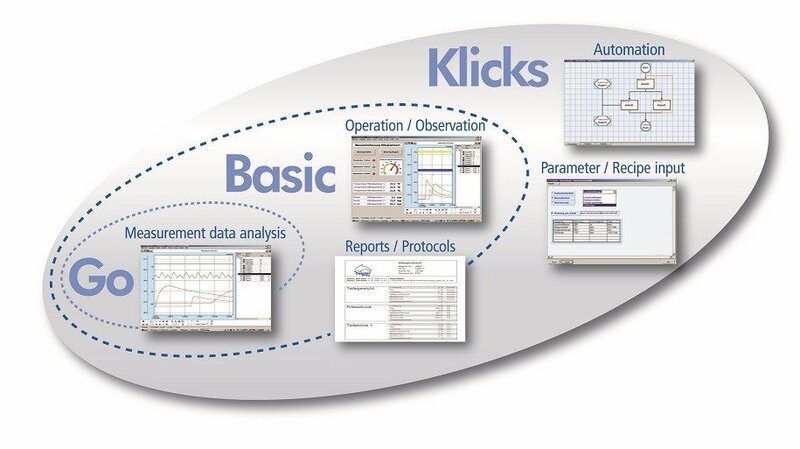 ProfiSignal Klicks enables test stand and laboratory automation, measurement data evaluation and accounting and requires no programming knowledge required. To complete the range of functions there are input templates for test parameters and recipes and documentation functions for protocols. Klicks provides users with a single package to generate their own automating and testing applications. ProfiSignal Klicks contains all the functions from ProfiSignal Basic and ProfiSignal Go. A parameter input screen is an important tool in test engineering and laboratory automation applications, and allows for the input of test parameters, recipes and batch data. Complete input and option templates can easily be generated, as can process visualization and viewing screens. ProfiSignal's SQL option makes it possible to import parameters directly from company databases. This reduces working times and eliminates input errors. 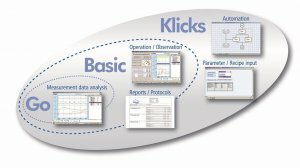 Klicks has been developed for technicians, engineers and scientists who want to generate their own processing procedures but without having to invest extensive time into programming skills. The Klicks automation language does not require the learning of a programming instruction set nor the typing in of instructions and commands. This eliminates any syntax errors from occurring. Full focus can then be given to the process control – a structure chart can be generated at just a few mouse-clicks. The structure chart is made up of special symbols that serve as containers for programming instructions. Double clicking on a symbol opens an instruction editor. This gives users the option of maintaining and updating applications or completed programs, even years into the future. ProfiSignal is equipped with optional interfaces for connecting external software and hardware. Drivers are available for data exchange with NI LabVIEWTM, DASYLabTM and DiademTM. Sensors and other control and measurement systems can be connected to ProfiSignal via OPC Server / Client and Modbus TCP. An API interface enables ProfiSignal to be integrated into high-level languages. OCX and .NET interfaces are also available. ProfiSignal can also be connected to external hardware. A range of drivers are available to connect external hard- ware. The following are examples of supported hardware: VXi, PSI, HBM, WinSocket and many others. Once a ProfiSignal project has been completed in development mode, a Runtime licence then enables its operation. ProfiSignal Runtime licence contains only ProfiSignal's runtime mode. Only completed projects that have been transferred to runtime mode can be started. Runtime mode is not intended for the creating of new projects. Runtime includes all ProfiSignal options available in the development mode. The ProfiSignal Viewer enables offline analysis of measurement data files and reports generated by ProfiSignal. ProfiSignal Viewer is suitable for users who require only data analysis or export, e.g. to ASCII or Excel files, and not the system's full functioning or online data features. The Viewer includes ProfiSignal options for trend diagrams and characteristic curves, e.g. cursors, markers, export and statistical functions. Diagram functions, e.g. cursor, export, markers, statistics etc. A Trend-App is available for the remote monitoring of systems, experiments, trials and test stands. Measurement data can be monitored live on a mobile device. Historical data can be zoomed by pinching and stretching movements on the mobile device's screen to display any offline time period required. The Trend-App can be configured according to user requirements. The "Audittrail" option enables monitoring systems to be validated according to the FDA21CFR11 guidelines. The audit trail automatically logs user actions as well as changes to configuration data. The log is manipulation safe. The option also includes automated versioning of ProfiSignal projects and a full system of password protection. The monitoring of measurement data such as pressure, temperatures, air humidity, particles and status is also recorded as manipulation safe. The option “Audittrail” logs any changes to the DataService/Configurator during the development phase as well as any changes to ProfiSignal applications during runtime. The ProfiSignal AlarmManagement option provides important additional functions concerning monitoring and alarms. An obvious requirement here is a user management system with different levels of access rights. ProfiSignal AlarmManagement functions also include alarm audit-trails and uninterrupted alarm recording. The ProfiSignal Vibro option extends the existing ProfiSignal functions by the following diagrams: FFT, cascade, time signal, orbit and spectogram. The full integration of vibration analysis into ProfiSignal means Delphin systems can be used to simultaneously portray process data and vibration data as characteristic values in digital / analog displays or in graph format. 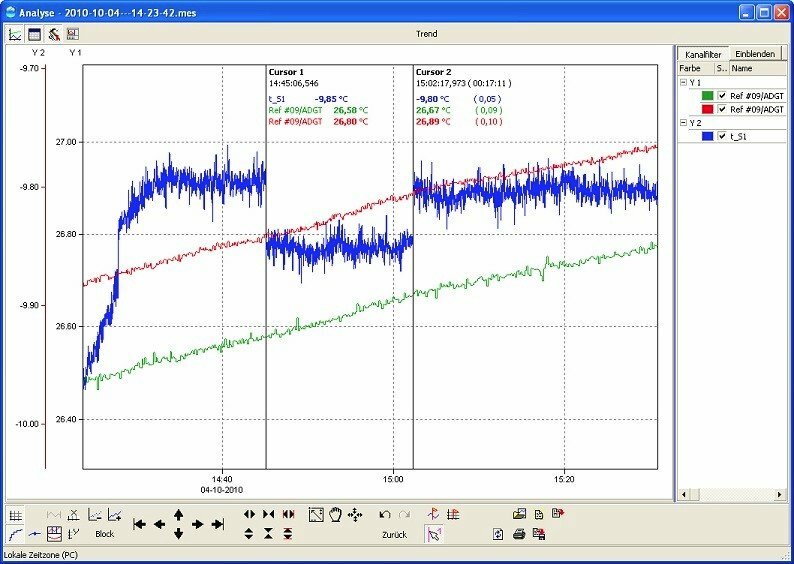 A ReportGenerator enables user-defined documentation for vibration data as FFT or cascade graphs as well as envelope spectrum curve analysis. Orbit and trend graphs provide for the graphical representation of kinetic shaft orbits including maximum Smax deflection and angular position / phase. The ProfiSignal Vibro option provides individual shaft vibration diagnosis in gas / steam / hydro turbines, super chargers and motors. The Vibro option can also be used for bearing vibration analysis in electric motors and roller bearings.